But if you liked watching videos on Blip for… whatever reason… your options are now severely limited. 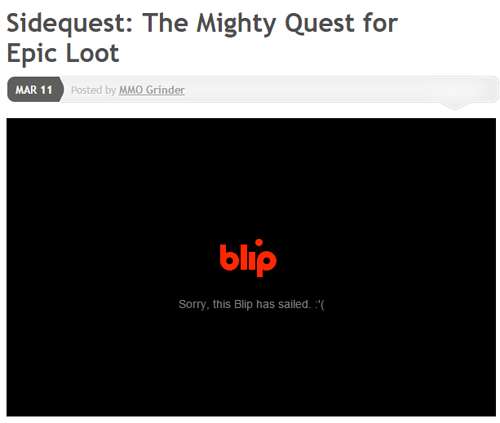 As of today, August 20th, 2015, Blip.tv is no more. Bad decision after bad decision left the site a smoldering crater for a long while now, and only now have the final embers of life within it have been snuffed out. And this is it. The final block of three. Four years of episodes! With that we are all caught up, and the road for the future postings can continue. I hope you enjoyed me attempting to enrage you with my filters off, and hopefully understand why I say what I say in my videos, as well as how I say it. But first, let’s close out this bore fest with the lackluster puffs of some wet fireworks. Out of the Nexonite frying pan and into the game that’s a current contender for my personal favorite of the year. I know, year’s not over yet. Too bad the follow ups were so comparatively underwhelming. This block has me giving Trion another shot at an Open Beta Tester event, which ran much more smoothly, followed by two instances of unremarkability. Don’t worry, it’s almost over. What’s in this block? Oh, that… Goody. This was an odd block of games, regardless. What a weird way to close out the year last year. Well here’s a parade of winners for you. Our first attempt at the Open Beta Tester event, leading to one of Grindstone’s most despised games, followed by an absolutely atrocious cash-in title followed by a butchered yet worshipped otaku paradise. Everything is wonderful. This block contains my first Raid Leader request on a game I had previous experience with, another requested title that underwent some revisions, and a game so weeby that even the weebs were too weebed out by it to fill my comments section with weeb scorn. (They petered that out on Mabinogi anyway.) Happy birthday to me. Did I lose anyone off that last one? Let’s try this again with the next block, where I look over a dead game, a dying game forced to swallow it’s own hubris, and a catatonic game. Isn’t the MMO Market so wonderfully stable?! This next block contains some interesting titles, and one not so interesting one. One is dead, one has waned in quality (as I’ve been told) and one has improved. I haven’t checked back with a single one of them yet, so I’m still looking at these from the time I reviewed them.